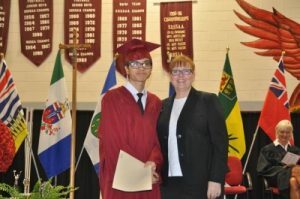 Sudbury Catholic Schools celebrate first two graduates from the International Education program! The Sudbury Catholic District School Board is proud to announce that the International Education program will be celebrating its first two graduates for the 2017-2018 school year! Loc Tran, an 18-year-old, international student from Vietnam became the first international graduate of St. Charles College this year. During his 10-month stay, Loc visited many places across the province such as Killarney, Toronto, Ottawa and Niagara Falls. He stated that he was very lucky to have the opportunity to have friendly teachers as well as a host family that cared for him and wanted him to obtain as many new experiences as possible. Loc stated that he made many international friends from various Sudbury Catholic Schools. He feels that this is an opportunity of a lifetime that others should embark on. In September, Loc will be studying Electrical Engineering Technology in London. Khoa Pham from Vietnam began his journey with Sudbury Catholic Schools in February 2016 at St. Benedict School. Throughout his three semesters at St. Benedict, he has really enjoyed learning about science, especially physics because of its hands-on learning environment. Khoa’s highlights include completing an Outdoor Education canoe trip in the French River area, and camping with his host family. He has really enjoyed his experience at St. Benedict, where he has created lifetime friendships with his classmates. He loved the supportive atmosphere that the teachers and staff at St. Benedict provided and enjoyed being able to explore Sudbury. Khoa will be returning in the Fall to St, Benedict to complete a semester before attending Seneca College for the Computer Support Technician program. The International Education program at Sudbury Catholic Schools welcomed 18 students throughout the 2017-2018 school year and will welcome 29 for the 2018-2019 school year.